As you probably have noticed! I am a bit dismayed by this whole new scandal that the Catholic Church is facing. And thus, I have been writing blogs about millstones and the Last Judgment and about the little ones. Because what’s going on is unacceptable and we need to speak out against it because abuse should never be acceptable, especially within our Church. And yet… there has always been a need for cleansing and sanctification within the Church. For instance! In the Old Testament, God calls for His people over and over to come back to Him. And why? Because His people were always running away from Him and doing horrible sins that were destable in His eyes! Then, in the New Testament, Jesus Christ repeatedly calls for repentance and conversion for those who are in the Temple. He is not afraid to yell at the Pharisees, calling them hypocrites and vipers. “Woe to them!” is a frequently uttered cry by Jesus… and that is a very serious charge. And then! You have this famous incident, which is quite popular in art… the cleansing of the Temple! Here is a picture by El Greco. A neat picture, right? But, let’s go into the art history a little bit, because that will make this depiction even more important and relevant to the day! You see, El Greco was an artist who was a critical part of the Counter Reformation…?! Now, you’ve probably heard of the Reformation, in which Protestantism first came out. Well, when the Reformation happened, the Catholic Church started a Counter Reformation. The idea? One of the big criticisms leveled at the Church during the Reformation was that it was not going back to the bible and instead was relying on faulty traditions that weren’t actually from Jesus Christ. Or worse, because there was a reemergence of classical culture that was leaking through to its art, the Protestants accused the Catholics of outright Paganism. And so, what did the Church do? It launched a Counter Reformation! And, as part of the Counter Reformation, they patronized some of greatest Renaissance artists and commissioned them to depict the events of the bible. Thus, through art, the Catholic Church would be encouraging people to meditate on the beauty of the Gospel and of Christ. And thus, El Greco came from this turbulent period! So, in this particular artwork, you can see Jesus Christ driving out various people from the Temple, just like the bible passage. But, look closer! This is not an accurate depiction of the biblical scene. This is as much of a commentary of the modern Church, in El Greco’s time, as it was supposed to be a reminder of the actual biblical scene. And so you see plenty of depravity within the scene. Yes, Christ is driving out the moneylenders, as the Gospel tells us happened. But there’s another aspect in this scene which isn’t entirely accurate, according to the gospel: the women lounging about half-dressed. Honestly, they look like prostitutes. And, in fact, that is probably what they were supposed to represent! After all, at the end of the 15th century, just before the start of the Reformation, Pope Alexander VI openly fathered four children (including promoting one to the position of cardinal) and opened up his papal palace to prostitutes. And that was just one of the abuses: many other clergy followed suit. And these sins openly committed probably spurred on the Reformation in large part! 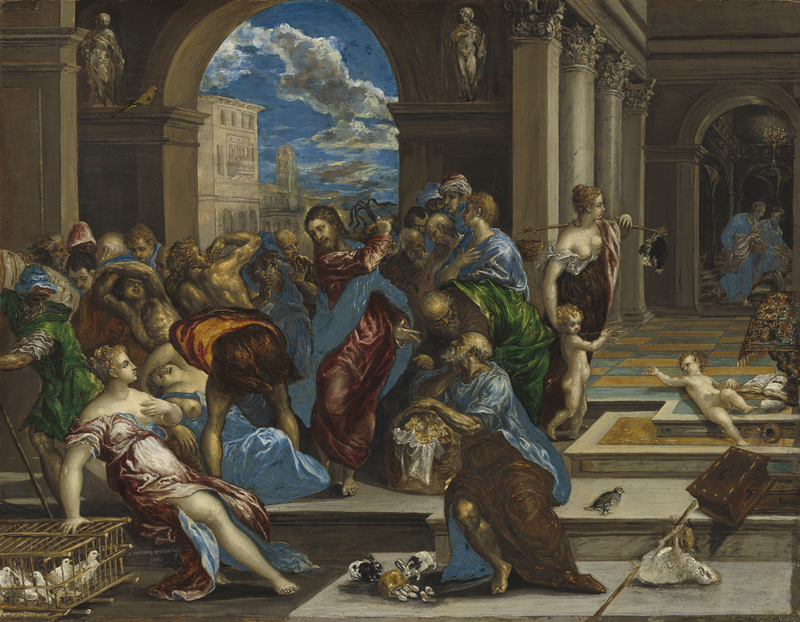 So this picture was not only meant to portray a gospel scene, but rather to remind people to follow the gospel and keep the Temple area clean from filth and profanity — including the filth and profanity that were especially prominent in El Greco’s day! Because, let’s face it: yes, Jesus loves the Church. But, no, He doesn’t want the Church to fall into ruin and depravity. So, as we face these new scandals, we should take heart and pray for Jesus to come and cleanse our Church, just as He once did. And we should not fear! After all, as Pope St. Gregory the Great once said, “It is better that scandals arise than the truth be suppressed.” For with Jesus comes the truth. And with Jesus, there is always hope and grace.